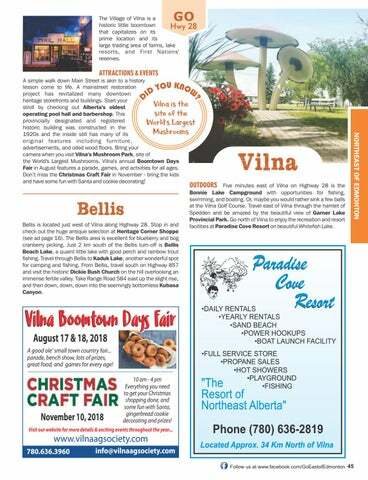 The Village of Vilna is a historic little boomtown Hwy that capitalizes on its prime location and its large trading area of farms, lake resorts, and First Nations' reserves. Bellis is located just west of Vilna along Highway 28. Stop in and check out the huge antique selection at Heritage Corner Shoppe (see ad page 16). The Bellis area is excellent for blueberry and bog cranberry picking. Just 2 km south of the Bellis turn-off is Bellis Beach Lake, a quaint little lake with good perch and rainbow trout fishing. Travel through Bellis to Kaduk Lake, another wonderful spot for camping and fishing. From Bellis, travel south on Highway 857 and visit the historic Dickie Bush Church on the hill overlooking an immense fertile valley. Take Range Road 584 east up the slight rise, and then down, down, down into the seemingly bottomless Kubasa Canyon. A good ole’ small town country fair... parade, bench show, lots of prizes, great food, and games for every age! 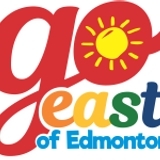 10 am - 4 pm Everything you need to get your Christmas shopping done, and some fun with Santa, gingerbread cookie decorating and prizes! OUTDOORS Five minutes east of Vilna on Highway 28 is the Bonnie Lake Campground with opportunities for fishing, swimming, and boating. Or, maybe you would rather sink a few balls at the Vilna Golf Course. Travel east of Vilna through the hamlet of Spedden and be amazed by the beautiful view of Garner Lake Provincial Park. Go north of Vilna to enjoy the recreation and resort facilities at Paradise Cove Resort on beautiful Whitefish Lake. A simple walk down Main Street is akin to a history lesson come to life. A mainstreet restoration YOU KNOW project has revitalized many downtown ID heritage storefronts and buildings. Start your stroll by checking out Alberta's oldest operating pool hall and barbershop. This provincially designated and registered historic building was constructed in the 1920s and the inside still has many of its original features including furniture, advertisements, and oiled wood floors. Bring your camera when you visit Vilna's Mushroom Park, site of the World's Largest Mushrooms. Vilna's annual Boomtown Days Fair in August features a parade, games, and activities for all ages. Don’t miss the Christmas Craft Fair in November - bring the kids and have some fun with Santa and cookie decorating!